Discover The Professional Way To Stay Prepared During Your Future Outings & Outdoor Adventures! Do you love going on outdoor adventures such as camping, backpacking, hiking, mountaineering or biking? Or perhaps you are a daily long commuter and you simply want to constantly be prepared for the unexpected. Either way, if you want to be 100% prepared for an unpredictable situation, we've got exactly what you need! 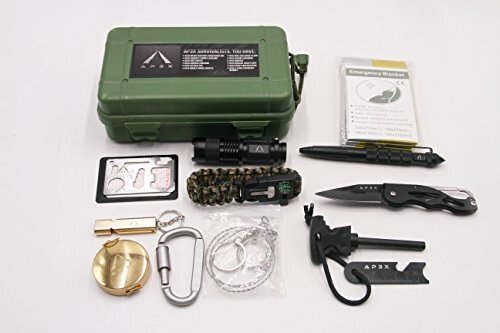 Presenting The Outdoor Survival Kit By AP3X! [11-In-1 Gear Box] Our survival gear, tools and accessories could easily save your life one day in the future as they are bound to help you stay safe and sound on multiple occasions. From extremely rough weather conditions to losing your path and ending up stranded in the woods or mountains, our outdoor gear kit will become your companion for life! Even if you don't go on many outdoor adventures, this tactical gear bag is absolutely a must-have. In fact, you should always keep one in your vehicle glove compartment or in your work or school backpack in case there is an accident or roadside emergency. You'll be glad you have one by your side! Scroll Up, Click 'Add To Cart' And Always Be Prepared the AP3X way! ➤【11-IN-1 OUTDOOR SURVIVAL KIT】Our preparedness gear kit includes a ferrocerium flint, 440lb survival paracord, compass, swiss card, flashlight, whistle, folding knife, aircraft grade aluminum tactical pen, and tactical box, specifically picked to assist you in a time of emergency whether it is an unfortunate car accident or being left stranded out in the wild. All items are sturdy, yet lightweight and are safely enclosed in the gear box which easily fits in your glove compartment and backpack. ➤【INCREASE YOUR CHANCES OF SURVIVAL】From the flint fire starter and 440lb emergency paracord bracelet, to the XL emergency blanket and tactical pen, everything included in this outdoor emergency kit has been handpicked to help you stay dry, get out of an emergency situation, find shelter and even prevent hypothermia and shock. Especially if you are someone who loves to explore, this Survival Kit is an absolute MUST-HAVE. ➤【BREAK CAR WINDOWS & SIGNAL RESCUERS】Perhaps the most important item in our kit is the aircraft grade aluminum tactical pen which can be used for breaking glass windows as well as self defense and normal writing. Our outdoor gear kit also features a double barrel whistle that can generate a sound twice as loud with the same breath as well as the high frequency design that can be heard from miles afar. ➤【LIGHTWEIGHT, YET EXTREMELY DURABLE】Our premium survival kit measures exactly 7.5 x 4.5 x 2.5 inches and weighs only 1lb! The case is shockproof and easily fits in any glove compartment, hiking backpack or bag. Not to mention it makes for a great gift for anyone in your close friend or family circle that's an avid adventurer or loves to gets mixed up in adverse situations. ➤【LOVE IT WITH A ONE YEAR WARRANTY】We invite you to give our emergency survival kit a try and promise you will never regret it. We truly hope that you never have to use it but if you do, you'll be so glad you had it with you. If you find any issues with the kit, rest assured that all our kits will come with a 1-year limited warranty. If you have any questions about this product by AP3X, contact us by completing and submitting the form below. If you are looking for a specif part number, please include it with your message.